Designed to reduce soil compaction and increase flotation, the purpose-built Vimcor undercarriage tracks also improve yields and lower operating costs. The new hub-mount transferable track undercarriage is an Australian manufacturing first, Vimcor says. The hub mount tracks provide farmers with the flexibility to use the tracks on a chaser bin during harvest and then transfer it onto an air seeder during planting. Vimcor tracks can be transferred from one implement to another within half an hour by using basic hand tools and a forklift or front-end loader. The tracks come ready-fitted to equipment with 10 or 12 stud hubs and have a reinforced frame; each track is mounted on two track end-wheels and supported by two track mid-wheels with width options of 24 or 36 inches. "Farmers who have so far used the tracks have commented on the heavy-duty design and smoothness of the operation," McNab says. "Those who have seen our track systems working are impressed with how well the track undercarriages turn and how little soil disturbance there is," he adds. "This is due to the very large 4.16-square-metre track footprint (36-inch track undercarriage) which greatly reduces soil pressure." 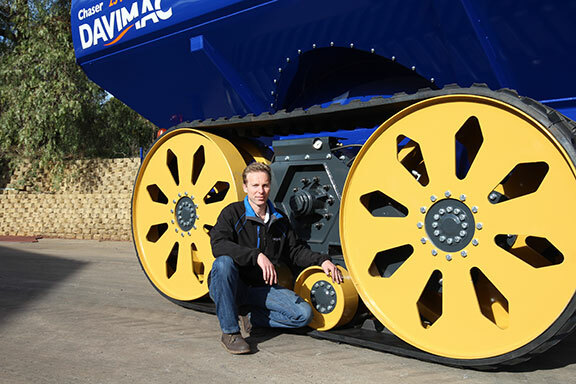 Vimcor Track Systems, a subsidiary of Chaser Bin manufacturer Davimac, has been operating in Australia for two years. The new Vimcor Hub Mount Tracks will be on display at the Agquip and Henty field days.